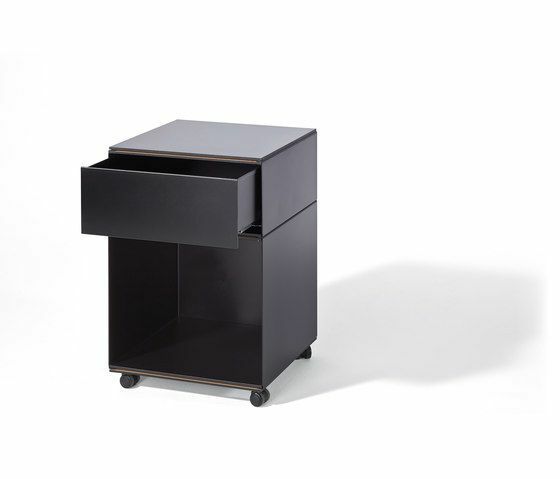 Stak: innovative storage designed by Patrick Frey. Individual trolleys, with or without castors, for the kitchen or the desk, or as a sideboard for the TV and other ‘technology’. Adjustable castors allow precise alignment. The vertical surfaces are made from thin, curved, sheet steel in either black or white. The shelves come in solid oak or in white or black MDF. Wooden drawers with black, white or oak fronts are available for the lower shelves.